Hey, how cool….somehow a wonderful writer, Caryn Fitzgerald, really liked my life story and kindly, out of many hundreds of submissions, chose to include me as one of the thirty people in her book…even put me on the cover!….yes, that’s me in the CelebriDucks varsity jacket on the left. I’ve always been a big believer in people following their passions and not accepting any limitations as to what’s possible. So if my story and the story of these other amazing individuals can help inspire others, I’m all for it. Ok, mom….are we ok with me not being a doctor now! Enjoy! December 10, 2009 khowes Comments Off on Inomommy Loves Michael Jackson & Mr. Green CelebriDucks! 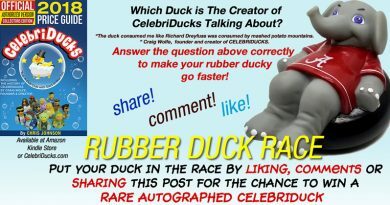 September 24, 2009 chrisjo Comments Off on CelebriDucks the Collectible Rubber Duck Celebrities!